this album is dedicated to the memory of Chuck Schuldiner R.I.P. Perfect change between aggressive, destroying and brutal parts, and soft, melodic and fragile parts, full of dark emotions. I’m really not the biggest fan of modern melodic Death Metal, but the Finnish Diablo managed to convince me that they are very worthy to listen to them. I would say that the biggest influence of the quartet is Fear Factory, and their sound could be compared to bands such as Soilwork or also Mnemic, and Diablo also have this fresh, this new and this modern, powerful style of Death Metal, but most important: They are modern, but they are absolutely not Nu (what a damn ugly word…). “Eternium” is full of cool ideas, tons of groove and as listener, you always are sure that Diablo are full of motivation, full of power in performing their music, and this feeling is transported quite well by the sound. Dynamic rhythms go hand in hand with great and heavy guitar riffs, most of the time in ultra-bangy midtempo (sometimes a bit faster), pounding drums and the voice of Rainer Nygard, changing between aggressive roaring and clean, hymnic and fragile vocals. In general, Diablo govern the perfect change between aggressive, destroying and brutal parts, sometimes a bit too monotonous, but it doesn’t really matter, and soft, melodic and fragile parts, full of dark emotions. “Eternium” starts with a funny intro, some kind of Finnish folk, I always have the picture of some sailors in my head, no idea why, but then suddenly, the fat guitars appear and immediately control the situation. The rhythm is indeed insane great, you just cant’t hold your head calm, and Diablo often integrate obscure, cold, sterile and industrial keyboards in their sound, just listen to “Read My Scars”. Also a trademark of Diablo are these great guitar leads, sometimes again reminding to Soilwork, but also to Children Of Bodom. The best track on “Eternium” is without doubt “Queen Of Entity” which contains a fantastic melodyline, which spreads a lot of energy, and during the chorus, a lady sings along with a beautiful and touching voice. 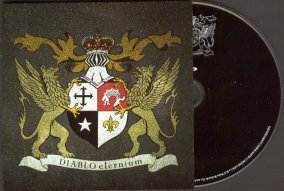 Towards the end of “Eternium”, some parts seem to be already on other songs, and the instrumental “Omerta” is just kind of boring, but besides of these two details, Diablo created a very good, a very fine piece of modern Scandinavian Melodic Death Metal, of course with a big, fat production full of power, and remember my words: We will hear a lot more of this band, believe me. Good job!